Following the Reader: 100 Follower Giveaway Winners!!! It's time to announce the winner(s) of my 100 follower giveaway!! Since I hit 250 followers while my 100 follower giveaway was open, I picked two winners! The winners of my giveaway have been emailed and have both responded! The winners were chosen with a random number generator (random.org). So I will now happily announce the two winners! Congratulations to both winners! I will be organising postage from the Book Depository today! Thank you to everyone who entered and to all of my new and old followers! I really can't thank you all enough. Thank you again so much for my prize - you know already how excited I am about receiving it! Thanks alottt Amyy!! 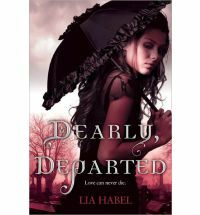 I cant wait to read Dearly Departed! And thank you Dani, hope YOU enjoy the unbecoming because i have read it and LOVED it!